We had a great full week back at school! Mazel Tov to all the kids in our class who were in the play. We LOVED the performance our class saw on Tuesday. It was truly fantastic! We are looking forward to our class Seder next week and we look forward to sharing the interactive experience with you. Please read the Reuse-It Recycle project email I sent out on Thursday. I am also sending a printed copy home in the Friday Folder. I hope all of you have a fantastic weekend and Happy Spring!! Help Fifth Graders support Camp Jenny, for underprivileged children. Please send new or gently used backpacks starting Monday, March 23 until Thursday, April 2. Collection bins will be located at the Lower School in the carpool lobby, gym lobby, and in front of the media center. Camp Jenny provides a wonderful camp experience for children at URJ Camp Coleman over Memorial Day weekend each year. This week was our third sight word review week. We continued to learn about verbs in grammar and will have our assessment next week. Now One Foot, Now the Other by Tomie Depaola was our story of the week. It was a really touching story about a close bond between a boy and his grandfather and what happened after his grandfather had a stroke. We then filled out a cause and effect graphic organizer to further explore what happened in the story and why it happened. We continued to edit and write our final copies of our present lives for our autobiographies and took our next comprehension assessment in our CARS books. Please be sure to sign it this weekend and have your child correct any mistakes before Monday. This week in math was all about fractions and we kicked it off with a SWEET lesson using different candy to show how fractions are equal parts of a whole. We then learned how to write fractions (and which part was the numerator and denominator). 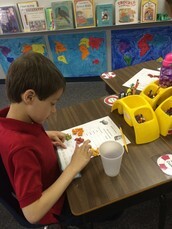 We did another munchy lesson where we sorted colored goldfish and wrote what fraction of each color we had. We all agreed learning about fractions is pretty yummy. We ended our week with a math quiz on fractions and then created fraction art using colored squares of construction paper. After making our creations, we wrote the fraction of each colored square we used. Last week we started our next social studies unit, Using Our Resources. We have enjoyed learning about natural resources and how we can help to conserve them. We have also learned about how our environment and farming has changed over time with new technology and ways to communicate. We will be reviewing our social studies unit next week. As this is a short unit, Tutorial will be on Thursday, March 26 (please let me know if your child will stay) and the test will be on Friday. This week was all about Passover— פסח ; we read the holiday story, sang holiday songs, learned related vocabulary and practiced for the Seder. In our Ariot book, we covered the letters פ (PEY), פ (FEY) and ף (FEY SOFIT). 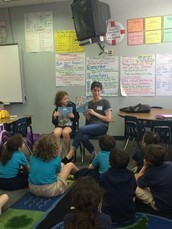 Thank you Dana Russotto for being our Mystery Reader! !